Home › Faculty Directory › Warren, Stacie L., Ph.D.
Dr. Stacie Warren’s program of research aims to elucidate psychological and neural mechanisms involved in the development and maintenance of psychopathology, particularly anxiety and depression. 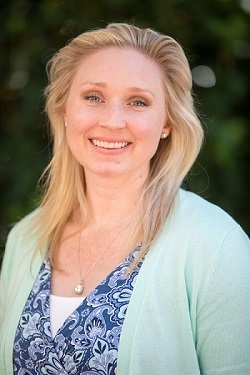 Her research focuses on individual differences in cognitive (e.g., executive function, attention, and cognitive control) , and affective factors (e.g., positive and negative affect) , and socialization experiences (e.g., attachment, adversity) as they contribute to emotion regulation and psychopathology. In particular, Dr. Warren’s research has focused on delineating components of executive dysfunction in dimensions of anxiety and depression as the specific effects are poorly characterized. This is particularly problematic because interest is increasing regarding cognitive training interventions and their applications for psychopathology. It is likely that executive function and attentional control are involved in these cognitive training programs, but the critical components of executive function have not been identified, and their role in cognitive control and psychopathology has not been defined. Her research utilizes interdisciplinary theoretical principles and multiple levels of analysis (e.g., neuroimaging, genetics, behavioral measures, clinical interviews, and self-report measures) to explore these topics. As a clinical scientist, she is particularly interested in the translational implications of her research for intervention, improving current treatments for anxiety, depression, and executive dysfunction, as well as developing new interventions. Dr. Warren completed her undergraduate training at California State University, Long Beach, and received her Ph.D. from the University of Illinois Urbana Champaign. She completed her pre-doctoral internship and neuropsychology residency at St. Louis VA Health Care System. Kaiser, R. H., Andrews-Hanna, J., Spielberg, J. M., Warren, S. L., Sutton, B. P., Miller, G. A., Heller, W., & Banich, M. T. (In press). Distracted and down: Neural mechanisms of affective interference in subclinical depression. Social Cognitive and Affective Neuroscience. Letkiewicz, A. M., Miller, G. A., Crocker, L.D., Warren, S. L., Infantolino, Z. P., Mimnaugh, K. J., & Heller, W. (In press). Executive function deficits in daily life prospectively predict increases in depressive symptoms. Cognitive Therapy and Research. Spielberg, J. M., Miller, G. A., Warren, S. L., Sutton, B. P., Banich, M., & Heller, W. (In press). Transdiagnostic dimensions of anxiety and depression moderate motivation-related brain networks during goal maintenance. Depression and Anxiety. Snyder, H. R., Kaiser, R. K., Warren, S. L., & Heller, W. (In press). Obsessive compulsive disorder is associated with broad impairments in executive function: A meta-analysis. Clinical Psychological Science. Sadeh, N. S., Spielberg, J. M., Warren, S. L., Miller, G. A., & Heller, H. (In press). Aberrant neural connectivity during emotional processing associated with posttraumatic stress. Clinical Psychological Science. Warren, S. L., Crocker, L. D., Spielberg, J. M., Engels, A. S., Banich, M. T., Sutton, B., Miller, G. A., & Heller, W. (2013). Cortical organization of inhibition-related functions and modulation by psychopathology. Frontiers in Human Neuroscience, 7, Article 271. Crocker, L. D., Heller, W., Warren, S. L., O’Hare, A., & Miller, G. A. (2013). Cognition/Emotion relationships and neuroplasticity: Implications for intervention in psychopathology. Frontiers in Human Neuroscience, 7, Article 261. Sadeh, N. S., Spielberg, J. M., Heller, W., Herrington, J. D., Engels, A. S., Warren, S. L., Crocker, L. D., Sutton, B. P., & Miller, G. A. (2013). Emotion disrupts neural activity during selective attention in psychopathy. Social Cognitive and Affective Neuroscience, 8, 235-246. Crocker, L. D., Heller, W., Spielberg, J. M., Warren, S. L., Bredemeier, K., Banich, M. T., & Miller, G. A. (2012). Neural mechanisms in attentional control differentiate trait and state negative affect. Frontiers in Psychology, 3, Article 289. Spielberg, J. M., Miller, G. A., Warren, S. L., Engels, A. S., Crocker, L. D., Banich, Marie, T., Sutton, B. P., & Heller, W. (2012). A brain network instantiating approach and avoidance motivation. Psychophysiology, 49, 1200-1214. Spielberg, J. M., Miller, G. A., Warren, S. L., Engels, A. S., Sutton, B. P., & Heller, W. (2012). Trait motivation moderates neural activation associated with goal pursuit. Cognitive, Affective, & Behavioral Neuroscience, 12, 308-322. Warren, S.L., Bost, K.K., Roisman, G.I., Levin Silton, R., Spielberg, J.M., Engels, A.S., Choi, E., Sutton, B.P., Miller, G.A., & Heller, W. (2010). Effects of adult attachment and emotional distractors on brain mechanisms of cognitive control. Psychological Science, 21(12), 1818-1826. Engels, A.S., Heller, W., Spielberg, J.M., Warren, S.L., Sutton, B.P, Banich, M.T., & Miller, G.A. (2010). Co-occurring anxiety influences patterns of brain activity in depression. Cognitive, Affective, & Behavioral Neuroscience,10, 141-156. Warren, S.L., Miller, G.A., & Heller, W. (2008). Emotional facilitation and disruption of memory. In M. Guadagnoli, A.S. Benjamin, S. de Belle, B. Etnyre, & T. Polk. (Eds.). Human learning: Biology, brain and neuroscience. Holland: Elsevier.